SoftPlanet makes it possible for everyone to get free SageThumbs download directly from our servers. There is no registration needed for downloading. SageThumbs 2.0.0.17 is a shell extension, which is designed to preview image files as easily as it can convert them. You are also allowed to set them as desktop wallpapers in three different modes – stretched, tiled and centered. The installation process is simple, however after it's finished, SageThumbs requires a restart in order for the changes to take effect. This smart software application allows you to copy pictures to the Clipboard, set them as wallpapers in three different modes (stretched, tiled or centered) and send them or their thumbnails to your friends via email. You are also able to convert images to JPG, GIF or BMP file formats. SageThumbs allows you to disable the context menu and the thumbnail in Windows Explorer. It is lightweight, so you won't notice if it is there. 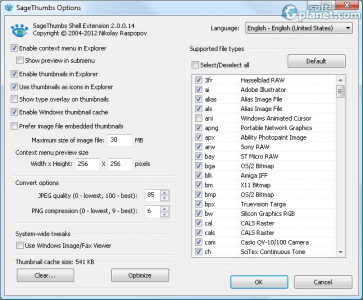 SageThumbs 2.0.0.17 is a straightforward solution for viewing and converting image files. It comes absolutely for free and with a simple interface. It works very smoothly without any lag. Our security scan shows that SageThumbs is clean from viruses. The current version of SageThumbs has been scanned by our system, which contains 46 different anti-virus algorithms. That ensures that SageThumbs 2.0.0.17 is 100% safe for your computer.